One of those pretty, peaceful spots that only seem to exist in the Midwest, Dubuque is one of Iowa's fastest growing towns and a wonderful place to visit. The town sits on the banks of the Mississippi River and is filled with fine architecture and various landmarks and attractions, including several buildings that have been classed in the National Register of Historic Places. It's also a lovely town to simply walk around and take in the scenery, with the surrounding woods providing some nice nature trials. At first glance, Dubuque might not seem like the sort of place where ziplining could be enjoyed, but the town actually boasts one of the best-rated zip line tours in the entire state of Iowa, with another super zip line experience just a short drive away. Let’s take a closer look at Dubuque’s duo of much-loved ziplining companies. Whether you're looking for adrenaline-fueled action or simply a new way to get in touch with nature and learn about local wildlife, the Sky Tours at YMCA Union Park Camp are a great place to start. This attraction has earned a lot of rave reviews since opening up and has been awarded several Certificate of Excellence awards from online tourist hub Trip Advisor. The Sky Tours zip line tour involves nine separate zip lines spread out around Union Park. Lengths of the zip lines vary between 300 and 1,000 feet and guests will be zipping along up to 75 feet off the ground, enjoying views of the natural surroundings as well as catching a few glimpses of the ruins of the park. Friendly guides will teach you all about the area and help you identify various examples of local flora and fauna too. All-in-all, this is a great zip line tour and a must-do for anyone in the Dubuque area. The tour is recommended for riders of at least 10 years of age and there's a minimum weight limit of 70 pounds. The upper weight limit is 270 pounds and guests are urged to wear sensible clothes and footwear for their tour. Skirts and dresses are now allowed, nor are sandals or other open-toed shoes. 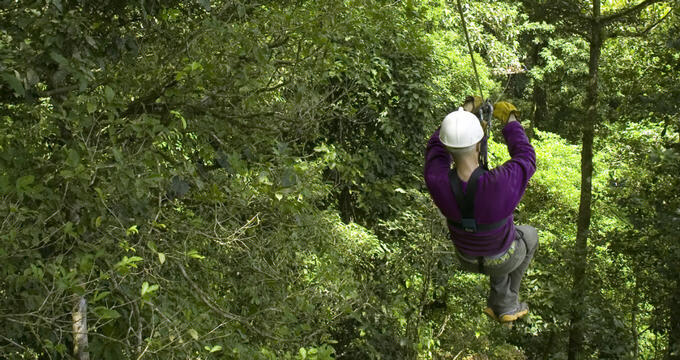 As with other zip line tours, guests are encouraged to wear close-toed shoes at all times and anyone with heart or mobility issues will be refused entry due to the physical nature of the zip lines. Some hiking is also involved in the tour, so a certain level of fitness is required. Long Hollow Canopy Tours is located a little drive away from Dubuque. Offering beautiful views of the Tapley Woods Conservation Area and Long Hollow Creek, this zip line tour is a real treat for anyone who loves to get outdoors and appreciate the beauty and tranquility of nature. The tour is made up of six separate zip lines, as well as two ladders, a sky bridge, and a rappel. Guests who don't quite feel comfortable enough to do the rappel also have an option of descending more easily. The tour starts off with a UTV ride through the woods and begins with short zip lines, easing the visitors into the ziplining action before introducing the longer lines, faster speeds, and more thrilling experiences. The final three zip lines are over 700 feet long, with the final line being a whopping 1,250 feet in total. Guests will glide along these zip lines several dozen feet above the ground at speeds of up to 40 miles per hour. It's a thoroughly exciting experience in every way possible, and friendly guides are on hand at all times to share information about the local area, answer any questions, and provide simple safety instructions to make sure every group member has the best possible time. The full tour lasts for around two and a half hours overall and ends up with the aforementioned rappel, providing one last adrenaline rush to finish the day. The minimum age requirement for this zip line tour is tour, and all guests aged between 10 and 14 will need to be accompanied by an adult. The weight limits for this tour are between 70 and 250 pounds, and all guests are weighed before setting off on the trip. Pregnant guests or those with heart or chronic health conditions will not be allowed to participate.